Chomp Rock 'n' Roll is the second level of World 1 found in Yoshi's New Island. 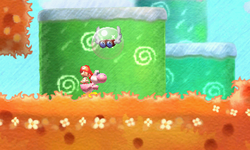 It introduces Mine-Cart Yoshi and is the first cave level in the game. Yoshi starts the level near a Chomp Rock and some Shy Guys, followed by a Mega Guy-producing pipe. The player can swallow one, turn it into an egg, and use it to clear an opening to the next area. Here, Yoshi turns into a Mine Cart and needs to proceed to the ring where his powers wear off while collecting clocks that add to his time. The next area contains a Checkpoint Ring, another Chomp Rock and some enemies, which are soon followed by the Goal Ring. Kusalkovalun, vpered! Chomp Rock, Go! Meongmeong'i'doleul Degureureu! Rolling the Chomp Rock!